Sure, I wrote about Rick Owens FW08 back in February, but this particular photo posted now on JAK&JIL is beyond cool. One might question that these clothes actually have even the tiniest possibility to prove themselves wearable. Still, no one could possibly avoid picturing themsleves wearing that kind of gear. I would especially refer to the boots at this point. They have avant-garde written all over them. The shape, so simple, yet so expressive! I'm jealous in a way on the mind that thought about designing them like this. I'm a fan of legwarmers in general so I think it is kind of decadent to put them in leather and zip'em in the front. And if that wouldn't have been enough, wear them unzipped, of course. I'm not being sarcastic, this is called decadence. And it is well appreciated. Well, by me at least, hahah. 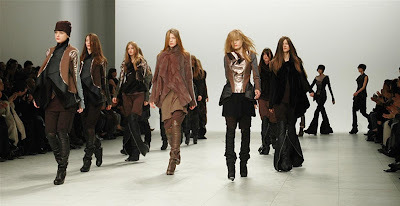 Style.com says "models did look like they had swaggered through the apocalypse." I wouldn't mind being the second girl from the right. The one with the silver, hmm, simliar-to-an-armor blouse. Nope, not a single bit, thank you very much. I imagine that if French Revolution would have started today, they would have wore Rick Owens.